The issue of corruption is not new to Hindi cinema. Also, in our movies, we are used to watching honest men jeopardize their lives to fight the all-pervasive corruption. Most of these movies depict their heroes as vigilante figures who are forced to take the law in their hands. But we don't get to see movies about men who try and fight corruption from within the system as often. It's not easy to blow the whistle on graft and it's even more difficult to fight those on top of the food chain. In the aftermath of the anti-corruption movement led by Anna Hazare many officers have come out in the open to expose the corruption around them but what of those who fought the deep seated corruption long before Haraze's famous movement? Raid, directed by Raj Kumar Gupta, is a tribute to those men and women who fought corruption much before the advent of electronic media. Set in the 1980s, Raid presents dramatic reconstruction of one of the episodes of actual raids carried by the officers of Indian Revenue Service wherein an honest income tax officer named Amay Patnaik (essayed by Ajay Devgn) exposes a powerful politician named Rameshwar Singh (portrayed by Saurabh Shukla) against insurmountable odds. But the film neither plays like a historical drama nor like a biopic. The template of a thriller would have suited it the best and the makers are smart enough to realize that. 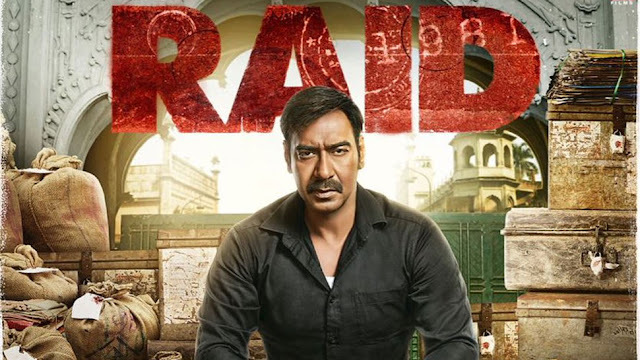 The film in its entirety revolves around the raid and so the element of predictability is certainly there but the writing and acting are good enough to ensure that the film doesn't fail to keep the viewer hooked. While the film suffers from a bunch of pretty average sequences, the moments of high impact are cleverly weaved in that add to the intensity at crucial junctures. Overall, Raid is a tightly paced thriller that packs a punch. It's always a challenge for a film set in one major location to keep the viewer engaged but the film is up to the mark. Also, it's amazing how Ajay Devgn can so effortlessly pull off these characters that hide so much of fire behind their passive exterior: be it Omkara, Company, Hum Dil De Chuke Sanam, Zakhm, or Raid... the list is endless. As far as Hindi cinema is concerned, it is difficult to think of another actor who could essay such deceptively simple characters with such poise. Ileana D'Cruz sadly gets very limited screen time and so the level of interaction between her and Devgn fails to match the high expectations set by their previous outing in Baadshaho. Devgn’s scenes with Saurabh Shukla are the film’s major highlight. As mentioned above, the plot does get predictable at a few places but it is never boring thanks to some good acting on display. When making a movie of this magnitude, one must be careful even when dramatizing something. Spoofs I observed: Aircraft used was not introduced till 1991 in the world. Gold is very heavy almost 2.5 times steel. Assuming that Mr. Lalan was 77 kg. it would take a briefcase of gold to balance him. Even the gold biscuits shown are more like chocolate slab rather then about half the size of Parles Glucose. Why don't movie makers invest in a Technical director who should be an engineer?